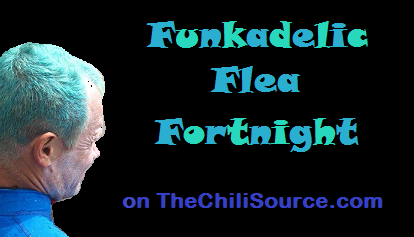 Two weeks of articles, magazine scans and fun dedicated to the funkadelic one, the almighty Flea, himself! As many of you know Flea will be running in the Honda LA Marathon to raise funds for the Silverlake Conservatory of Music on 20th March and we want to help him along the way! So we’ll be putting out something at least once every day, along with the donation link to Flea’s fundraising page, and hopefully some of you might make a donation to his fundraising effort in support of the bass slappin’ maestro as a result ! It’s not all about giving though because special rewards and prizes are being given out by Flea’s fundraising team randomly for various donations along the way and if you donate at least $25 by the 3rd March 2011, you will be entered for a draw to win a bass guitar signed by ALL of the Red Hot Chili Peppers! The Silverlake Conservatory of Music is the music school that Flea set up to help all students, no matter their background, in the Los Angeles area get affordable music lessons. Music had been the salvation of Flea’s life and he believed that everyone should have access to learning it; he was therefore shocked upon visiting his old school, Fairfax High, to find that music lessons were about to be axed due to budget cuts. Around that time his experiences as a guest conductor at the Junior Philharmonic Orchestra of California and also from reading the autobiography of jazz pianist, Horace Tapscott, inspired him to act and the idea for a music school that offered affordable lessons for all was born. This dream was realised in 2001 when he set up the Conservatory with his friends Pete Weiss and Keith Barry. Since then, Anthony Kiedis has joined the Board of Directors. Don’t forget! 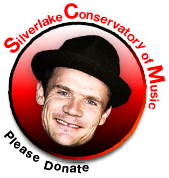 Please DONATE to Flea’s Fundraising Marathon run for Silverlake Conservatory of Music! This entry was posted in Flea, Red Hot Chili Peppers, RHCP General by Squitherwitch. Bookmark the permalink. your Intentions, when I can TRULY see now how they were Inspired out of a HUGE Concern that Children would be denied ACCESS to the Intelligence of MUSIC, I feel VERY Regretful!!! And Knowing that it is a PUBLIC CONCERN, I BELIEVE The Entire Public NEEDS AWARENESS of how our Government has been cutting this out of our Schools. If you had just handed a check over and had not been willing to also put in the work of training for a Marathon, I doubt anyone would have REALLY Understood how MUCH of an Important Issue MUSIC Education is for EVERYONE!! I SOOOOOO HOPE that you can Feel my APPRECATION and the know that I am MOURNING my assumptions, a lot! Although it does not imply that I didn’t Support your PLIGHT and FIGHT for Children to be exposed to the Healing and Beauty of MUSIC!! IF you sensed any harshness in my words, it was there…If you thought I didn’t care, that is not true, if you felt angry, annoyed, pissed, outraged, etc…I may have stimulated that although I am not the source of your Feelings. I heard the amount of money, thought about how much you must have earned through being a musician yourself, thought about all the broke musicians out there, who couldn’t afford to donate, even if they did REALLY want to be able to and thought why help create a whole bunch more musicians if only a small percentage will be able to support themselves and their families on the income that it provides if they are not able to be in bands, orchestra’s, groups etc…that do get the kind of exposure and Support that allows them to live off of their Contribution to the WORLD. I of course want more and more and more children to learn the ART and Theory of MUSIC. Being someone who Home Schooled as a single Mom and given my background, it was hard to hear the amount of money and not think, I bet I could do it for less. I get that from my Mom. LOVE AND LIGHT with DEEPEST SINCERITY AND RESPECT! !